Deyaar Facilities Management LLC Dubai is conducting latest walk in interview for hiring staff. 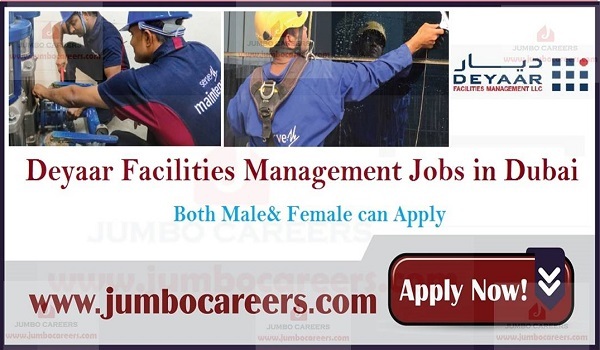 Benefits of Deyaar Facilities Management jobs Dubai include Accommodation + Transportation + Medical Insurance. * All of the required fields would be fulfilled with at least 1 to 2 years of hospitality industry experience. * Having the ability to speak and write basic English, Hindi & Tagalog. Although, Arabic would be an added advantage. * Only those applicants would be selected who can join us immediately. Rest will be disqualified. Location : Deyaar Facilities Management, 1st Floor, 51 Tower, Al Abraj Street, Near Carrefour Market, Business Bay, Dubai.